Evidently EPISD is doing a better job controlling their administrative costs than the other local districts. This entry was posted on Friday, October 26th, 2018 at 5:00 AM and is filed under El Paso Independent School District. You can follow any responses to this entry through the RSS 2.0 feed. You can leave a response, or trackback from your own site. Tim is now getting triggered on El Chuqueno … and we operate in an echo chamber. Somebody can’t handle a little constructive criticism. Just to clarify: I am no longer actively involved on this blog in any identity, or with any fake identity that you readers have appear to have associated with me, due to the insane echo chamber effect that exists here and the inability of the moderator to control the discussions from becoming personal. I have not posted here for quite some time. If I do, I sign my name, I do read the posts on occasion, but do not comment, as I have found it an exercise in futility. This singular post is an exception because, as usual, people are accusing me of things that I am not saying. I do find it interesting that anyone that supports EPISD is automatically associated with me. Apparently I am the only person anyone on this blog can think of that might support EPISD. If you want to read my opinion, which I am sure all of you are eagerly awaiting, you are more than welcome to read my weekly columns in the El Paso Herald Post or on my blog. Tim –– If you think so little of the readers of this blog, why come back to promote your blog and your columns in the EPHP? A little self-serving, huh? “insane echo chamber” … Just to clarify … that’s your EPISD administrator insulting the readers of this blog while the Penny Swap is up for election. It is a shame when a person is such a coward that they have to use different aliases when trying to support their flawed argument or idea. In this post-WOW, ANN FERREL, and NAZI GERMANY are all written by the same person. It is easy to go back and identify his other posts, some with his real name. I have never said anything derogatory about the EPISD unless I have backup for my complaint. The steady stream of EPISD propaganda is pumped out for the public to digest and this keeps them in power and their 100K+ BS Jobs while teachers cannot even get their step raises. I wish some forensic auditors would look at the administrative salaries while Garcia was spending $400,000 on his mistress. The public has lost millions of dollars with these raises. Interesting how most on here always bash EPISD for being top heavy yet when a report comes out, either from EPISD or TEA then the data must be falsified or made up or masked numbers or because they are too large. Of course numbers can be masked as I have no doubt all districts do for various things just like government entities do. Just as with the cheating scandal, all districts were doing it, one just got caught. Oh no wait….several internal audits determined other districts were doing the same thing as EPISD. I am not saying I am pro or con EPISD but the constant bashing by the usual suspects does become boring and expected after a while. We get it. Most of you hate EPISD, do something about it to make it better, other than whining on this blog year after year. I will await the usual response of I am Deputy Dog as I offered an opposing view on EPISD. Deputy, an opposite view is fine if it is not backed up with a 100K+ job working for these people. I have told everyone this particular report is BS and years ago I used the EPISD data that took a long time to put together to show the people that look at stuff like this stuff how bogus it was. While they never got back to me the did kill the law that required this report. They left it in the FIRST report just to make it a little larger but it is no longer a required report by law. But I guess people like you (100K+) will grab anything that tries to make your district look good. The word of the day is don’t rock the boat and don’t do anything to draw attention to the district. As for all the other districts cheating, do you have any proof and if so why don’t you present it to the FBI, you just say this to try and mitigate the actions of EPISD employees, many who were probably not caught. I didn’t put it on a scale of insidiousness, I simply said EPISD was not the only one district engaged in cheating. However, thank you for proving my point that you would follow your typical response of accusing me of being Deputy Dawg…right on cue predictable Dan. Interesting how you want to have a dialogue about an issue unless it is someone with an opinion who makes a certain salary amount or is employeed by a certain entity. Sure seems like what you are really saying is as long as someone’s opinion aligns with yours then they have a voice. 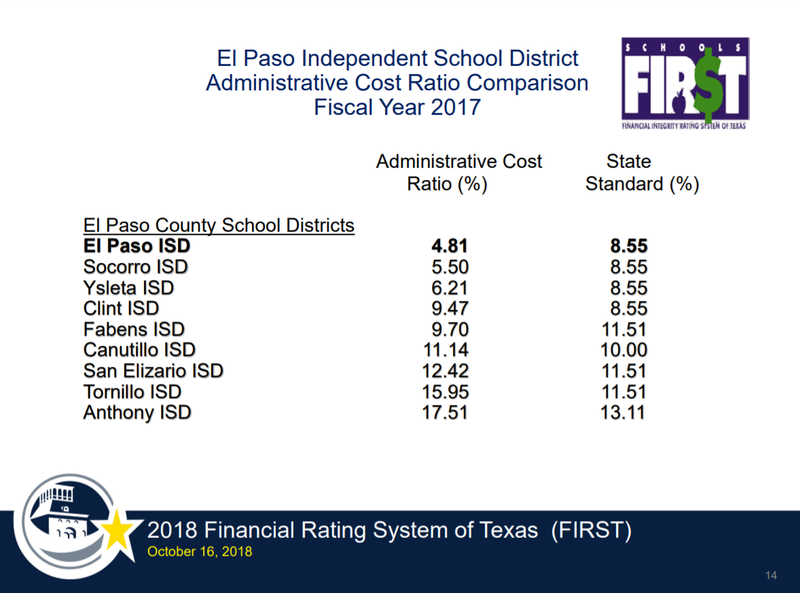 I believe the point being made is not to mitigate the actions of EPISD but rather to say other districts did it as well yet nobody bashes SISD, YISD and CISD the way they do EPISD on this blog, thus a bias towards EPISD no matter what. From your response it seems like you just confirmed Wows point. Ann Ferrer, since there were no examples of other districts doing the same things that EPISD did what other than trying to mitigate responsibility could his post mean Superintendent gets caught in a half a million dollar bid-rigging scheme and gets an extension on his contract! The ethics in the EPISD are laughable! Did you not read the article with the audit findings? Wow never said the exact same thing was done in all districts. He/she said cheating occurred. Again you just keep proving the point. It must be difficult to have so much hatred for an organization that you look at everything through blinders. I feel sad for you. I’ll speak for myself, Dawg. I don’t send my children or pay tax dollars in those other districts. According to Dan, only those who don’t make a living in EPISD are allowed to have an opinion. Glad he is no longer on the school board. I believe Hilter implemented similiar techniques based on race and religion as opposed to employment and income. Hail Dan! How old are you Dan? We are less interested in the opinions of Canutillo tax payers, Dawg. Public servant calling Dan a Nazi because the district should listen to its constituents. … you really don’t get it. Dawg, you get paid by EPISD and live in Canutillo. If you want to work for a public school, there’s one little catch. You have to listen to the public. You probably are Deputy Dawg. Thank you for again confirming that the members on this blog are so predictable. This is good news. But I wonder if it isn’t also just a function of their size relative to the other districts. If we ranked the districts by size the list would probably be in the same order. If EPISD had to have one superintendent for every 900 students, like Anthony, they too would have a higher administrative cost ratio. EPISD can pay their super ten times what the Anthony super gets, plus give him plenty of assistants, and still be more efficient. Still, efficiency is not quality. I’m not saying that one large, county wide district, would deliver a higher quality education; it would just have certain inherent efficiencies.